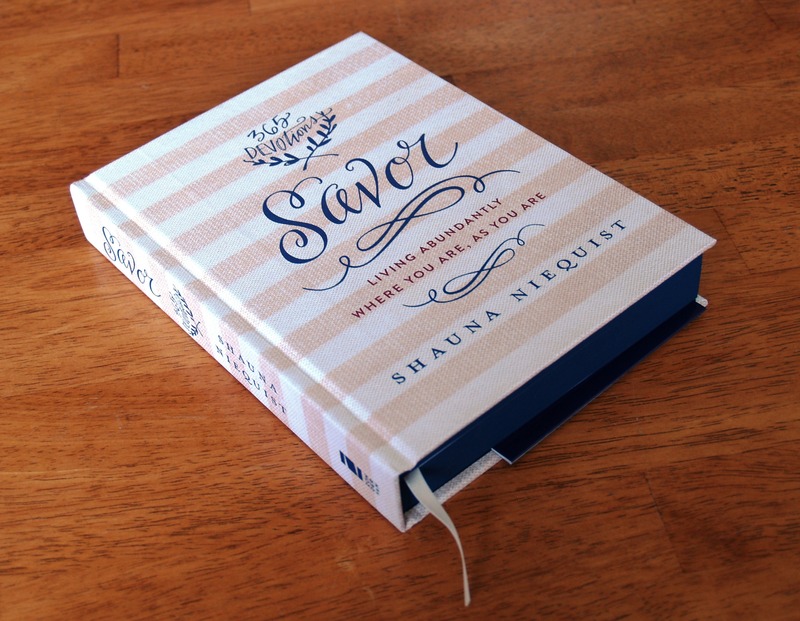 Shauna Niequist’s latest book, Savor: Living Abundantly Where You Are, As You Are, is a must-own. Departing from the short stories and essays in her memoirs Cold Tangerines, Bittersweet, and Bread and Wine, Niequist offers readers a book with a scripture and meditation for each day of the year. My first reaction: Savor is beautiful. The cover is linen bound, and the pages are just the right weight. I adore the navy and maroon color scheme, and the hand lettering by Lindsay Letters is to die for. And the content. The content! If you (like me) are somewhat of a fan-girl for Shauna Niequist’s previous books, you’ll recognize some of her stories and ideas from those books mixed in with the new content. Each day’s devotion has a short scripture verse, and then a bite-sized meditation, followed by a prompt for thought, journal writing, or prayer in response to what you read. Mixed in with the devotions are 21 recipes of her favorites–I can’t wait to try some of them! I’ve been reading Savor more mornings than not these last couple of weeks, and I’ve enjoyed the tone it sets for my day. If you are looking for a daily reminder to ground yourself in the things that matter, and to savor the fleeting everyday we are all gifted with, you will not regret picking up a copy of Savor.